Elements are fundamental substances of matter - matter that is composed of the same types of atoms. At present, 118 elements are known (four of them are still unnamed). Of these, 98 occur naturally on Earth (hydrogen to californium). Most of these occur in rocks & minerals, although some occur in very small, trace amounts. Only some elements occur in their native elemental state as minerals. To find a native element in nature, it must be relatively non-reactive and there must be some concentration process. Metallic, semimetallic (metalloid), and nonmetallic elements are known in their native state. The element carbon principally occurs in its native state as the minerals graphite (C) and diamond (C). Graphite is the common & far less valuable polymorph of carbon. Graphite has a metallic luster and a silvery-gray color. It is very soft (H = 1), has a slick, greasy feel, and readily marks paper. 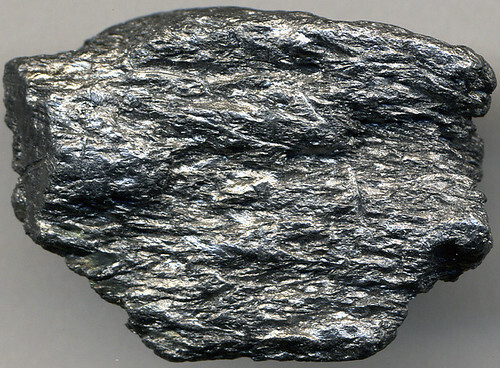 Graphite does have cleavage, but it is not apparent at the hand specimen scale. The ability of graphite to mark paper, its softness, and its greasy feel are all a consequence of cleavage sheets easily slipping over each other on a microscopic scale.